Aside from its incredible build and lightning-quick updates, I'd argue that the most interesting thing about the Essential Phone is how low its price dropped in such a short time; this once-$700 phone hit an all-time low of just $249.99 on Amazon last month for Prime Day. 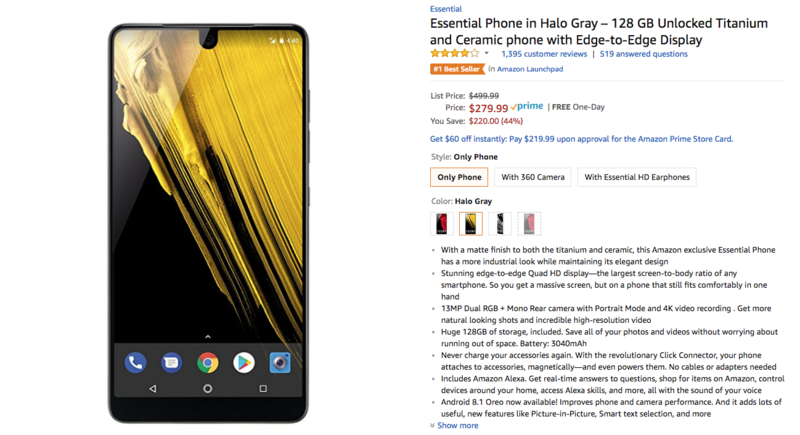 Today's deal on the Halo Gray Essential Phone can't quite beat that, but at $279.99, it comes close. The Essential Phone comes with a 5.7" 1440p LCD, a Snapdragon 835, 4GB of RAM, 128GB of storage, dual 13MP rear cameras, an 8MP selfie-shooter, and a 3,040mAh battery. The beautiful edge-to-edge display is accompanied by a very premium-feeling ceramic back, and the phone already has Android 9 Pie. It's worth noting that some have complained from issues on T-Mobile, so be wary of that. This discount only applies to the Halo Gray model, which was released in February as an Amazon exclusive. It has Alexa on board, but you can still use Assistant. One-day shipping is free with Amazon Prime. Hit the source link below to snag one.